Hyundai’s are long-lasting, dependable vehicles that require preventative maintenance and proper repairs. 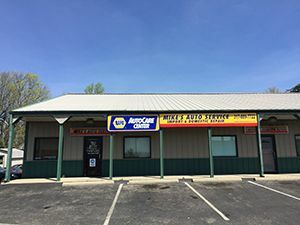 At Mike’s Auto Service, we have the knowledge and resources necessary to provide you with superior Hyundai service and repair in Greenwood, Indiana. As a NAPA® authorized auto care center, you can trust our ASE certified mechanics to fix your Hyundai Elantra or Hyundai Sante Fe problem, the first time every time! We offer a wide range of professional Hyundai services, including everything from factory scheduled maintenance to major engine work, and more. With more than 30 years of experience in the automotive repair industry, there is no job too large or too small for our certified technicians. As a family owned and operated company, we understand the value of a dollar and never forget to keep our customers’ best interests in mind. This is why we provide skilled automotive service at economy-based prices. You can get first-class Hyundai repair and service at a fraction of what the dealership will charge. And new customers can even receive a 10% discount on any service or repair! We also offer written estimates, tow truck service, and more. Call our office today at 317-889-7722 to request a quote or schedule an appointment.